How "bad" is the offseason for businesses ? the thing i hate the most is some of the best new farang owned places to eat close within months. when the snow birds leave and the farang tourist leave the place gets REALLY QUIET. forget chinese they have a few of their favorite places and that is it. i would spend at least one year here to get the idea for best locations and business cycle. what kind of food are you doing? and you need a really good cook even for a simple breakfast. many UK trained Thai ladies have their small restaurants around town. Married to farangs. Chiang Mai is definitely affected by off-season. The less palatable restaurants struggle. My caddie was saying her income has halved since two months ago. I did a big loop through Issan in low season some years ago. I was parking my car at 500-room hotels which only had 2 - 3 rooms occupied. I doubt the Chinese are making up that kind of shortfall. towards on the high end of the scale is Carlo Italian Restaurant. Then many much more casual pizza pasta places near the Hilton tourist area. I know where to get a great Spaghetti carbonara out of a cart for 60 baht. I really think you should come here in June and look around in the evenings. it can be slow. Yup food here is a tough business. I can get this ฿60 carbonara topped with bacon sitting down as an appetizer before the salmon steak arrives. Funny, I stayed in a Resort in Lopburi that was huge, brand new, gorgeous, cheap...and empty. Sometime I wonder how these places make any money. Like the Indian Restraunts on Sukky...they are like morgues. i had heart pains just looking at that. In our village the only restaurants that make any money are the ones that live there and have no rent to pay. There are too many of them anyway IMO. There doesn't seem to be a quiet season this year so far for us, bloody foreigners everywhere. Quite possible that the Indian Restos are used to convert black money (proceeds from money lending, etc) into the 'honest' variety. Easily done by reporting rather impressive income figures for tax purposes, pay the appropriate tax on these 'earnings' and, hey presto, the dosh becomes nice and clean. Maybe same for other locations / enterprises. But don't dig too deep - certainly less than 6 feet!! trying to understand the impact of the off season in cities in Thailand other then Bangkok. if I had to quantify it I would say Hua Hin eateries experience a 60-70% decrease in business between May 1 until Oct 1. 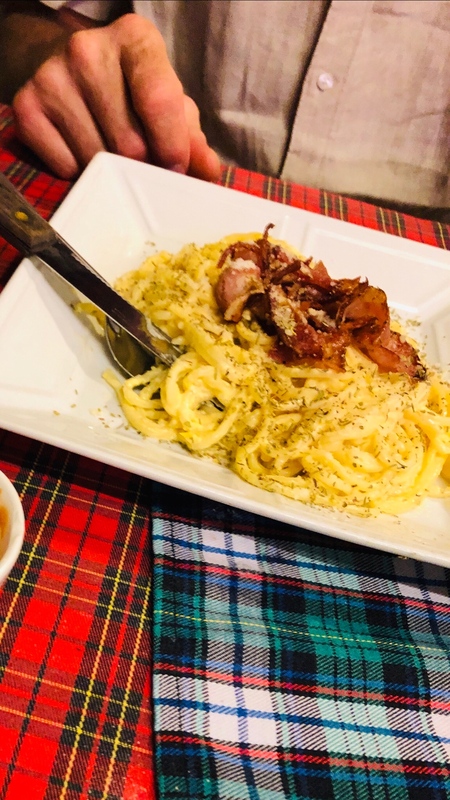 I can get this ฿60 carbonara topped with bacon sitting down as an appetizer before the salmon steak arrives. One of things I love most about HH, the off season. Very quiet except on the weekends when people come from Bangkok. If it was me I'd be adding a Thai slant to the menu to capture some of off season crowd which could be adjusted as the tourists came back. Not an easy way to make a living in my opinion.